Worm farms just don’t get much better than the Worm Café from Uncle Jim’s Worm Farm. Designed for both indoor and outdoor use, the vermicomposter uses worms to turn organic waste into nutrient-rich worm castings and worm tea. These organic materials make the perfect all-natural, earth-friendly compost for your garden. The Worm Café is notable for its simple and straightforward design. It doesn’t attempt to do anything fancy but works incredibly well. The three-tray design increases both environmental friendliness and worm productivity. Read our in-depth review of the Worm Café to see if it’s the right kitchen composter for you. The product clocks in at 22.5 x 29.5 x 15 inches. It weighs roughly 10 pounds when empty. Despite its small size and light weight, the Worm Café is very sturdy. There’s very little wiggle once it’s assembled and filled with organic material. The small dimensions also give the assembled product an equally small footprint, allowing you to keep this vermicomposter inside just as easily as it can be kept outside. It's is constructed from 100% recycled black plastic. It utilizes a 3-tray layout to make collecting worm castings easy. Each tray is side ventilated to keep air flowing through without allowing rain inside. Mounds on each collector tray encourage the worms to move upwards where the newest organic waste is located. The bottom tray of the Worm Café is the collector tray. This is where the worm tea accumulates. The tray’s base is sloped so the worm tea moves to the corner where the collection spigot is located. The spigot uses a drip-free design to make collection of the worm tea mess free. The company has designed the entire unit to be as functional as possible. For instance, the spigot and legs are designed to prevent worm tea from leaking out, dripping down, and staining the ground it sits on. Anyone that’s used a vermicomposter before knows that certain models act as a magnet for ants and other insects. The Worm Café attempts to counteract this with a fly-proof lid and ant caps on the legs. The drip-free spigot minimizes the temptation of nearby insects to pay your worm farm a visit. Assembling the product is easy as it gets. Instructions for both assembly and use are engraved on the lid so you never lose them. Setting up the worm farm takes minutes at most. The Worm Café works like most other worm composters. Fill it with kitchen waste (or other organic waste) and add a few worms (red wigglers are a popular choice). Worm population will double within a month as they work to break down the organic waste. After a short period of time, your self-contained composter will contain more than enough worms to efficiently break down your organic waste. The Worm Café is capable of holding roughly 8,000 worms. 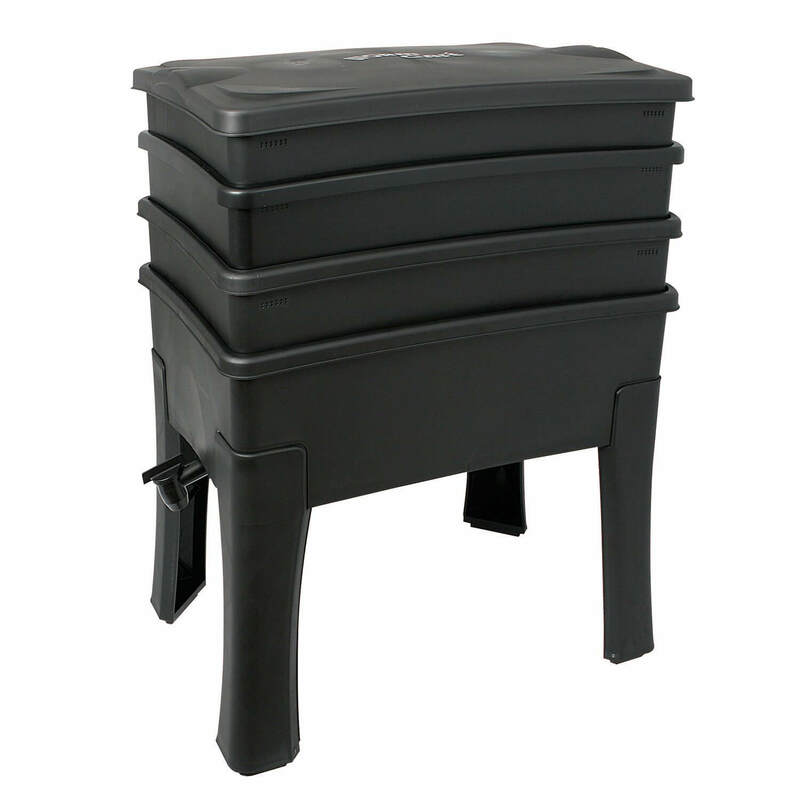 This composter is an environmentally friendly and highly efficient way to process organic food waste. It keeps food waste, mail, newspapers, and more out of landfills, turning it into a nutrient-dense fertilizer in the process. 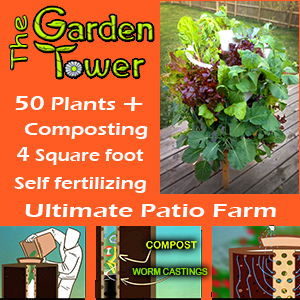 Use the resulting fertilizer to increase the health of your plants or garden. It will increase crop yield and create better tasting food. Solid Construction – Despite its plastic construction, this kitchen composter is as durable as they come. It’s strong, sturdy, and will survive years of heavy abuse. Easy to Collect – Three-tray design makes it easy to harvest worm casings. No heavy lifting or sifting is required. The non-drip spigot makes it equally easy to collect worm tea. Pest Proof – Non-drip spigot ensures there’s no residual worm juice left on outside of unit to attract pests. Fly-proof lid and ant caps on legs further ward off vermin. Instructions on Lid – Assembly and use instructions permanently engraved on the lid. Never lose instructions again. Affordable – At a little over $100, it costs an arm and a leg less than other products in its class. For example, many competitors sell their vermicomposter for $200 or even $300+. No Worms – Worms aren’t included with the Worm Café. However, they’re easy to purchase locally (from a store like CVS) or online on Amazon. 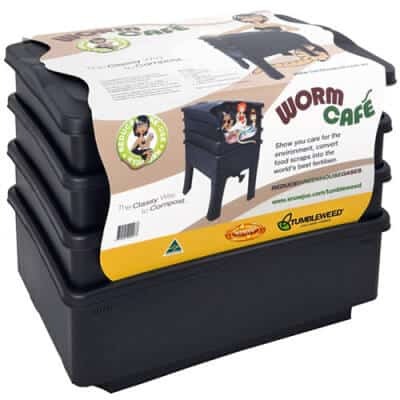 The company offers a wide range of Red Composting Worms and European Night Crawlers for affordable prices. No Worm Blanket – A worm blanket increases the efficiency of your warms. It creates the dark, moist, warm environment worms need to thrive. You worms can use it as a backup food source when you’re away for extended periods. Though the Worm Café doesn’t come with a worm blanket, you can easily purchase one from the manufacturer. Potential Loose Fixtures – A handful of people have noted that certain fixtures become loose after prolonged use, particularly the spigot. A loose spigot can result in leaking worm tea. Fortunately, the spigot is easy to tighten so the problem doesn’t persist. Is Uncle Jim's Worm Farm Cafe Right For Me? Uncle Jim’s Worm Farm Worm Café is an affordable, entry-level option for those interested in vermicomposting. · Simple and efficient design. Very basic to use so that you reap all the rewards of worm composting without any hassle or mess. · Low Capacity – Best for those interested in using as a kitchen composter only. As long as you plan to use your compost bin for kitchen waste only (no room for yard waste), then this is the perfect food composter for you. We highly recommend it for its low price, simple assembly, fast composting time, and overall ease of use.